This isn't a 403a, but a cool ad for Slant-O-Matic machines. I love my 403, it has quickly turned into one of my main default machines. I love treadle machines, I have some cute vintage 3/4 size machines - but when I just want to get a sewing project done, especially clothing, I hop on the Slant-O-Matic. What is the name about? Singer came up the slant shank idea to make your work in the needle area more visible. The shank holding the presser foot is slanted, putting the stitching area further in front of the machine rather than straight below the machine. I do think it makes it a bit more visible, but it isn't what I love about the machine, I just like how well it sews, the stitches it is capable of, all of the accessories available. It goes fast when needed, has a zig-zag stitch and with some extra goodies can do even more. I am plenty happy with my 403a. The cabinet it is in held a 404, shown below which I sold and replaced it with the one above. 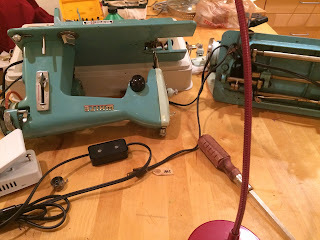 The 404 is a straight stitch only machine, a real workhorse and great for quilting, but I have several other straight stitch machines I love so it needed to find a new home. My 403a takes cams to make fancy stitches, Singer calls them Fashion Discs. These are often called Top Hat cams, because of the shape. And here is a list of additional ones available at the time it was made. I usually try to have one in my etsy shop. It is great to use for finishing seams on the inside of garments, especially knits. Instead of using my serger, which is usually threaded with white, I can switch to this combo and finish the raw edges with the same thread that I used for the project. Very cool. Other Fashion Aids listed include darning and embroidery attachment, edge stitcher, gathering foot and the tucker. I have to make some time to play with these one of these days. An upgrade I made to my machine was to get an LED lightbulb, it is cooler to the touch and gives a nice light. I meant to polish it up for a glamour shot, I recently discovered that Blue Magic TR-3 Resin Glaze, an automotive cleaner and polish, works great on these painted mid-century machines to shine them up. Of course try it in a hidden spot first. This is an automotive product, and it really makes them shine! I used it on the 404 shown above, see that showroom gleam? I'm not sure if I have really said clearly what I love about the 403a, so here's a list. Just not a picky machine, will deal with thick or thin fabrics with no complaints. I've been going through my boxes of sewing machine stuff, and listing things on Etsy as you can see in the side bar. Slowly I am finding some room in the studio to maybe actually sew something. A lot of what I list is Singer stuff, they make it so easy with the Simanco numbers on every part, I can do a bit of research and say what machines the part is for, and even what it is called. But after awhile I found out that the most common cams are C cams, and listed a few sets of them. Almost every time I listed a set, someone emailed me to see if the set included cam #1, part number 26841. It never did, usually the sets are starting with a 2 or 3. 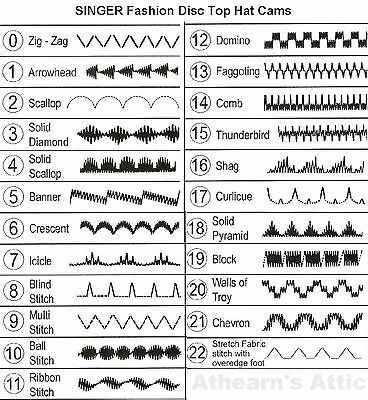 I had to investigate, and eventually found out that cam #1 is the basic zig zag cam that came inside many of the Kenmores which use the cams for fancy stitches. This basic cam allowed it to make zig zag stitches, or worked with the buttonholer to make buttonholes. Since this cam wasn't included in all the cam sets that keep showing up in yard sales and thrift stores, it is actually really hard to find. Hopefully when you get that great old heavy metal Kenmore, it has that cam inside it. But occasionally people get one of these machines and find they don't have that cam. In my internet searches I find posts from people looking over the last number of years. Well in a random box of Kenmore (mixed with Singer and unnamed stuff) I found one of these cams. When I tried to find out how to price it, I couldn't even find completed listings to see what they sell for. Why are they missing? I have a feeling more machines were junked with that cam in them, or machines were donated with another cam in them and the cam set (including the #1) got separated from the machine. I don't know, but they sure seem to be rare. I thought about keeping it for awhile, possibly in case I got a Kennie missing this cam -- but I really need to downsize on machines. And on that note, next time I hope to write about my newest little cute Kenmore, a 1030 in the great rose patterned case. Yes I know I said I was downsizing, I did sell two machines this month. But the overall machine count isn't going down much. 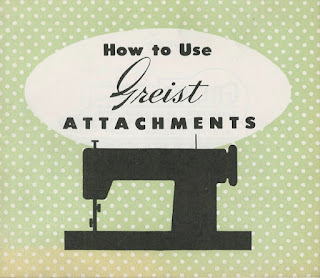 Reading about vintage sewing machines the other day, (when I am sure I should have been doing something like dishes or actual sewing) I read about using the hemmer attachments on a Davis NVF. The poster showed a picture of a gorgeous hem, and I wanted to do that! The hem I saw online was done with the one that slides on, but for some reason mine was not fitting onto the machine so I tried the second kind. Let's just say it was not a fun afternoon, and the results were not pretty. Especially interesting to see that even more experienced folks have to fiddle and fuss to get it started. I like how she started out, this doesn't work with hemmer feet that are attached, but I was able to use this technique to get it started with the Davis hemmer, then tighten it down on the bed of the machine. Then a 1 1/4 inch hem. This was becoming kind of fun! I was getting kind of giddy now, after feeling like a doofus trying to make a hem yesterday, here I was making nice hems! Hooray! So I had to try it on one more machine, my Singer 403a. This is a slant shank machine, and takes a different foot, 161195 for slant shank machines. The diameter is a tiny bit different, the 120855 makes a 5/64 inch hem. The one I have for the slant shank is 5/32, so bigger but still a small hem. Starting out on the slant shank was a bit harder, mainly because this machine wants to SEW and it is hard to just do a stitch or two to get it going. But after fiddling a bit I had the same luck. I wanted to try it with something a bit stiffer that wasn't trying to fray like my cheap cotton, so I grabbed a scrap of ironing board cover fabric I had left from a project. The fabric ruffled a bit from stretching as I put it through, I am sure I can adjust that with stitch length and being more careful not to stretch it as I feed it through. But yay, hemmers! Singer also makes an adjustable hemmer I haven't played with yet, and I have hemmer feet for my White Family Rotary too. Lots of options to try still. But I learned it is super important to use fabric that is clean cut, and if it is too floppy a bit of spray starch would really help. Starting a stitch or two and then stopping and making sure the fabric is feeding correctly really helped, not too much or too little fabric or it gets all wonky. And holding onto the threads with a bit of pressure to start those first couple of stitches feeding through helped cut down on funky folds in the beginning. A bit more about buttonholers, and zig zag machines. Most of what I have learned lately is about buttonhole attachments for zig zag sewing machines. Of course you can use the straight stitch attachments on your zig zag sewing machine, but it doesn't go the other way. The zig zag buttonhole attachments use the zig zag stitch on your machine to make the buttonhole, rather than moving the fabric back and forth to make the stitch for the buttonhole. I got to try this out, with a Griest 1Z buttonholer on a Singer 237, and it made a sweet buttonhole. I am planning to put this machine into a treadle cabinet, and it will be great to have a machine I can treadle that zig zags and does buttonholes. So Griest made seven different buttonhole attachments for zig zag machines, they are listed on the box I photographed in the earlier post. 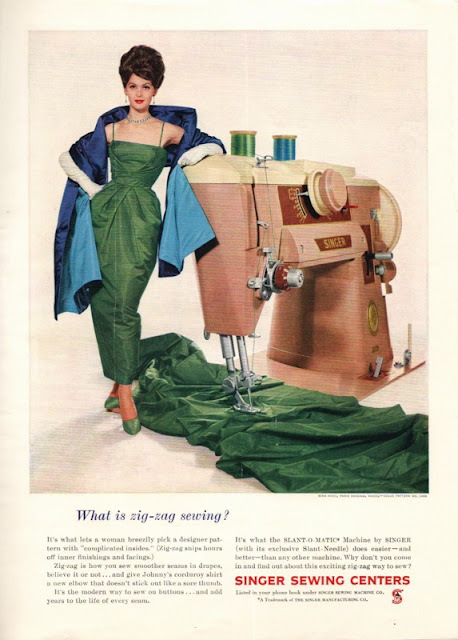 Singer is the big player in the vintage machine world, and they made their version for zig zag machines in the 1960s when they brought out the Professional Buttonholer. This comes in a model for slant shank zig zag machines, and for vertical needle machines (low shank). This is the first time there are different plates for covering the feed dogs according to the type of machine you have. So you have options. You can use a straight stitch buttonholer on your zig zag machine by setting it to straight stitch, of course you have to match up Shank type and needle position. All of the Singer buttonholers up to and including the Jetson's case ones are for straight stitch machines (or zig zag machines with the needle set to straight stitching). But the Singer Professional, and the Griest models with a Z on the end are for zig zag machines. Hope this helps someone, it took me a bit to sort it out. That's what happens when I get most of my sewing goodies from a thrift store! Sphinx Singer 127, another Mother's Day machine. Several years ago, early in my vintage sewing machine obsessession hobby, I picked up a neat 1962 White sewing machine from a Craigslist ad on Mother's Day. I guess maybe we started a tradition, because I was due to collect a new treadle and it worked out that the day I could go pick it up was once again Mother's Day. Isn't she a beauty? The serial number dates her to 1928, and the ornate decals sure fit the Flapper era. Beautiful cabinet too, although the top will need some TLC. This is a vibrating shuttle machine, it has that bullet shaped shuttle with the bobbin that looks like a little bar, rather than a round bobbin. I found the VS intimidating for a long time, because it looked so different that a round bobbin. But once I got my Davis NVF I had to get over it, and I got over it quickly. Basically, it's a bobbin. You wind it on the machine. Then you have to hold it with the thread coming off a certain way and you put it in the shuttle, put the shuttle in the machine. You close the cover plate and you sew. No real learning curve, it's just a different way of holding the bottom thread to create a lockstitch with the top thread. http://www.treadleon.net/sewingmachineshop/shuttle/vsshuttle.html and if you get a vibrating shuttle machine it is really fun to watch the bobbin wind, it's a pretty ingenious mechanism with the guide going back and forth distributing the thread as you treadle. There are some great videos of the process on Youtube also. Can't wait to get a belt on her. Something I learned about attachments that might help you. Forums are great, aren't they? 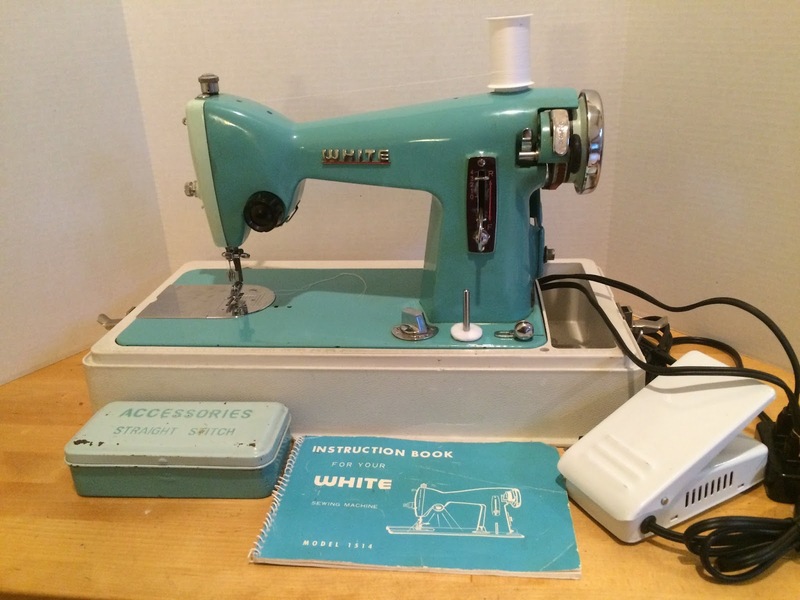 I learn so much reading about vintage sewing machines on Ravelry and other social media. 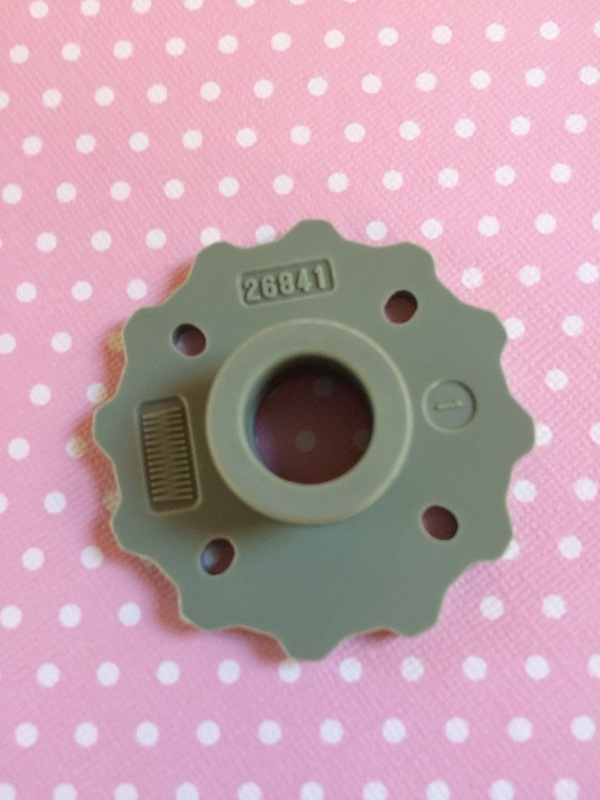 I was listing a set of attachments in my Etsy shop today, and I realized that they included a type of attachment foot that used to puzzle me. Finally some helpful soul explained, and it was really a light bulb for me, so I thought I would share. Now how the heck does something like that attach to the machine? Hope this helps someone, it did help me! And for eye candy, here is the really nice set of Kenmore attachments I was photographing when I decided to share this tidbit. I don't know if you can see how clean and shiny they are, but they look super clean. If they weren't in the original box, complete with oil stain and $3 price tag I would have thought they were brand new. White 1514, great mid-century looks. I had to combine parts from two machines to get this one together. I bought both of them from the same seller a year ago. One was in a cabinet, but the one I fixed up ended up being the parts machine head. Funny story, someone did the same thing, they took the best parts off of both machines, and put it in the cabinet. But they either didn’t have the set screws, or didn’t know they existed, and so they welded the machine to the hinges, burning the cabinet and the machine. So I switched all the needed parts back to the “parts” machine, and put it in a plastic case I had. It took awhile figuring out every little bit that was missing, and polishing the chrome -- but once I got it al together it stitched perfectly right away. A manual and box of attachments came with the machine, but if you are lucky enough to find a cool retro turquoise and chrome White 1514 you can download a copy of the manual here at the Singer site. Singer has many White manuals, just type a W in front of the model number to look them up. Or just type a W to search all the White manuals they have. Here is a link to the manual for the attachments from that era http://www.sil.si.edu/DigitalCollections/Trade-Literature/Sewing-Machines/pdf/sil10-215.pdf.